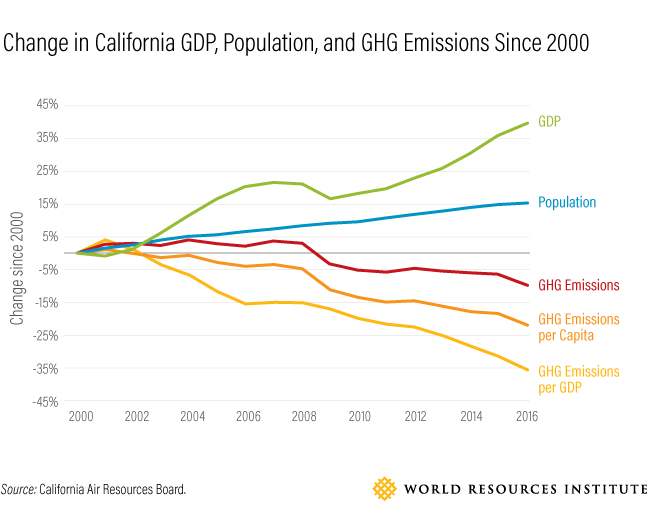 In my first post on Insights as Director, WRI United States, I’m going to focus on good news from California, where I have been working for the last four years. The news is this: the Golden State’s comprehensive suite of climate policies is working. Newly released state data show that in 2016 — four years ahead of schedule — California met its 2020 target to get greenhouse gas emissions below 1990 levels, as set by the Global Warming Solutions Act, also known as AB 32. This represents a 13 percent reduction of global warming pollution from the state’s peak emissions in 2004. Meanwhile, California’s economy grew by 26 percent during this same period. The state’s success in driving down emissions of heat-trapping gases while expanding its economy confirms research demonstrating that effective climate action and economic growth can – and must – go hand in hand. It also provides a model that cities, other states, and eventually the federal government can examine and adapt to their own unique economic and political circumstances. Note that these numbers do not include land sector emissions or removals, which can vary considerably from year to year as a result of wildfires, and can also significantly influence California’s net emissions over time. The state recently published a forest carbon plan, but has not yet adopted specific quantitative targets for removals in 2030. This was accomplished with a comprehensive approach to addressing pollution, combining a cap-and-trade program that establishes a cost for pollution, with complementary policies to drive technological innovation and deployment. Building on its remarkable early success in bringing emissions under 1990 levels, California has set an even more ambitious target of reducing emissions to 40 percent below 1990 levels by 2030. Doing so will require the state to continue to reduce power plant emissions. Crucially, the state will also have to reverse the trend of rising emissions from cars and trucks. Even eliminating emissions from the power sector would not be enough for California to meet its 2030 target if it doesn’t also make significant reductions in emissions from the transportation sector. California’s longstanding car culture makes this challenging. Planning for smart growth to enable people to access jobs, shopping, services and recreation without depending on single occupancy vehicles. California’s size, political culture and unique status under the Clean Air Act (which the Trump administration has targeted) allow it to lead in ways that would be far more challenging for other sub-national jurisdictions. But other states, cities and the private sector can individually and collectively adapt California’s policies to their needs and adopt their own suite of measures to cut emissions and spur economic growth. Whether sub-national action will be enough to compensate for a hostile federal government and allow the United States to achieve the emissions reductions it pledged to make under the Paris Agreement on climate change remains to be seen. WRI is contributing to an analysis of that question sponsored by America’s Pledge and will have more to say about it in September. Stay tuned.